Along with Apps, SharePoint 2013 has introduced App Parts (ClientWebParts) which give you the functionality of placing the app inside and iframe on a page. This way, you can view your app as a part of the page just like you would a normal webpart. Adding an App Part to the page from the SharePoint User Interface is pretty easy. You just put the page in edit mode and add the AppPart from the Insert Menu. Pretty similar to how you would add a regular WebPart. 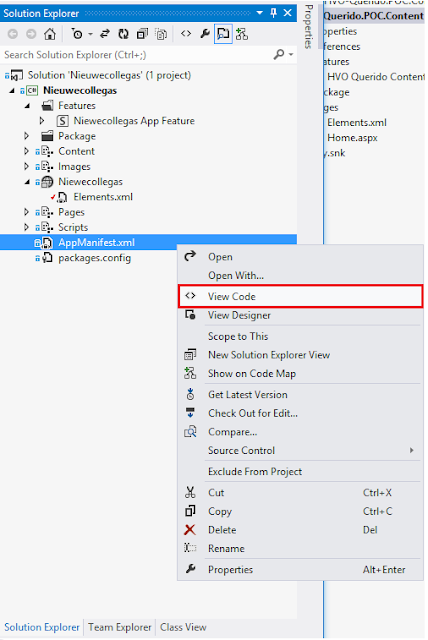 Now what if you have to provision your AppPart in a Page or a PageLayout so that when a new page is created with a feature, your AppPart is automatically placed on that page?. Here, I have created a Client Web Part with 2 Properties of type int and enum respectively. Second, you have to make sure that your app is already installed on the Web on which you will be provisioning your page. The AppPart will only work if the app is installed on the same web. 3) Save your ProductId in a convenient location. In FeatureId, enter the ProductId which we got from the app earlier. In ProductWebId, create a new random GUID and add it. You can even set default values for the App Part Properties. 5) That's It, Now deploy your page and see that the App Part is Provisioned on the Page. Since app integration has become more of a focus with SharePoint 2013 this is an important feature. Many apps have been created that will make the process that much easier. 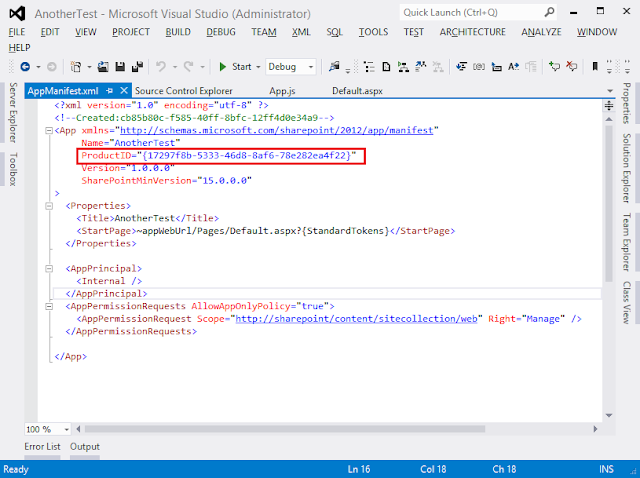 Could you please specify how to setup existing App Part properties from the Elements.xml file. For example: How to setup the Chrome Type property to be "None" instead of "Default" which is the default value. Can i do it in SharePoint online 2013? if yes, Let me know how please? 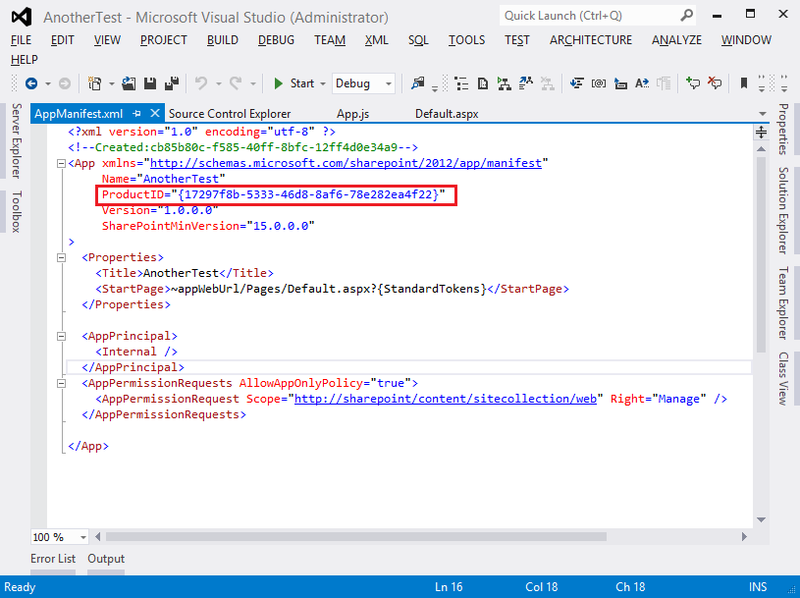 I can use the sandbox solution to deploy the page, but Microsoft deprecate using this solution in SharePoint 2013. Yes you can do this in SharePoint Online 2013 too. Microsoft has deprecated code inside sandbox solutions but we can still provision lists, pages, webparts etc. declaratively through them. You can have a look at my other post to see how you can deploy an app part to page using the Elements.xml file in a sandbox solution. Thanks for the post. Ver informative; however, I am encountering some issue. I used both of your approach too add a client web part to my page but I keep getting this error: "MyWebPart ClientWebPart feature 6c1ca245-6868-43a3-968c-5914a76159c8 is not installed or is not Active." My solution is a autohosted app but the page I am adding as webpart both live in the app web. What you can do is, you can add the app part to the page manually. And then see the source of that page through SharePoint designer. You will get all the necessary IDs which you can include in your solution. It works and I could add my app as webpart in a pagelayout. If I open a page which uses this pagelayout, the app is displayed in the page. What should I do to enable web part properties? Hi, I have the exact same problem as Tolga. Anybody found a solution? How would you go about setting the (host) url of the current page in one of the properties? I am using this inside of a master page, so really confused about it. I need Value to be the current host page url. Nice Article. My Problem is I want replace New ProductID in place of Existing ProductID and I want change version. May I possible to change ProductID and Version in AppManifest.xml. Please help if you know the process. Thank you for Advance. "The MyWebPart ClientWebPart feature b8344d09-7cc0-4f72-a8c3-8f02129d7633 is not installed or is not Active". can you please tell me what are the ids needs to be changed? Can you please tell me what are the ids needs to be changed?. I added web part id ID="g_499aa355_6bba_483d_91bc_6aa7f7726274" as it was in client web part. its working now. Thanks for the valuable post. Am getting below error after i added the client app part in page. "Feature is not installed or is not Active in sharepoint"
Good post! This is exactly what I'm looking for. I'm currently trying to add an AppPart in a page layout. When changing the page layout, I get this error: The MyAppPart ClientWebPart feature 3fbaae91-f4f8-402f-ac5b-0e4b60fc1283 is not installed or is not Active. You need to have the App installed on the web where you are trying to provision the app to the page. I know it's not a perfect process in terms of provisioning. Maybe you can look into Side Loading the App as part of your provisioning process. I've got the same issue as above. I've found that app feature ID is different that it was specified in AppManifest.xml file (last character is different). Do you have any idea why this ID changes?